I have a 120v fan (under 2Amp) that I need to be turned on and off via temperature, basically if TempA is 10deg higher than TempB, then turn the fan on. Once on, keep it on until the temps are equal. Someone recomended the Sonoff TH for this, but it looks like it only has a single sensor port, whereas I need to compare 2 temps to decide if the fan is to turn on or not. Can someone recomend another all in one solution? I need to put this rig up in an attic, so I kinda like the idea of something that comes in a retail-like case, and the WIFI was a definite bonus so I can hopefully mess with it without having to climb into my attic. Do you need this to all happen from a single MySensors node, or can you do it with a few nodes with the logic happening at your controller? I had tried a MySensors node with daisy chained 1-Wire sensors, but didn't have a lot of luck. The other part of it is that if you need the sensors to be some distance from each other, having it all on one node might be a problem. Having the logic happen at your controller will give you more flexibility on programming at what temps things happen. At some point I plan to do something similar in my basement. My "Man Cave" in the basement is long and narrow. I have a fireplace at one end. I have temp sensors at both ends of the room. 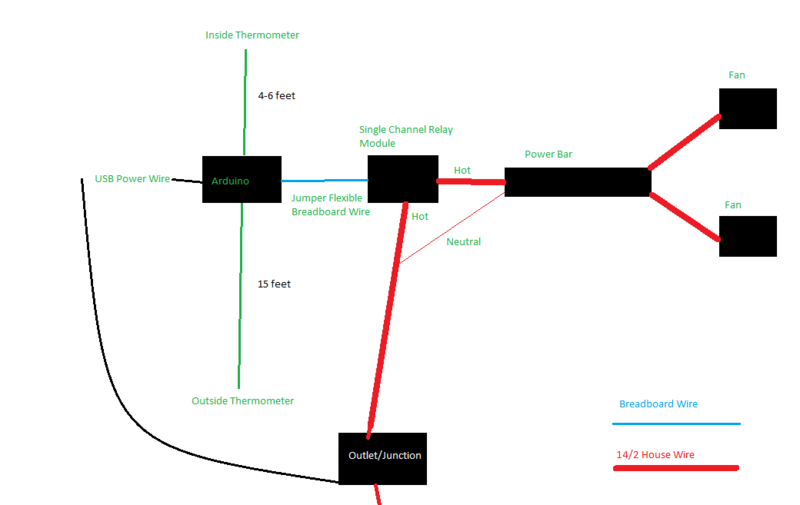 My plan is to monitor both temps, and if I have the fireplace going, which will naturally bring up the temp on one side of the room, and if the temps differ more than a set number of degrees, switch on a fan to circulate the air. I plan to do the business end of the logic from Domoticz. @dbemowsk Your mancave project sounds EXACTLY like my setup. Two thermostats at quite a distance, fan (powerbar actually) gets powered when temps are <> a few degrees. I'm not sure about the other questions. not sure what a node or controller is. I don't care how it works, really. This was a mockup I had made back when I thought that arduino was the right way to go, but it seems there are all in one solutions (like the sonoff, except it lacks the extra sensor port) that will do it better. I'm pretty open book about this project. I'm ready to buy whatever someone tells me to buy, as long as it's going to work, and will be somewhat reliable so I can stick it in the attic and forget about it. not sure what a node or controller is. I don't care how it works, really. A node would be a MySensors device (arduino with a radio module) with one or more of the following attached; sensor, relay, switch, or something like that. The radio module would talk to a gateway node that is attached to a computer running some kind of controller (Home Automation) software. If this one thing is all you are trying to do and you are not trying to set up other home automation stuff, you shouldn't need the whole MySensors setup. You could probably do this with just an arduino board, 2 DS18B20 temp sensors and a relay module. The only problem in that would be that you would have to program it for a certain temp differential and any hysteresis that you would want in play, and it would be static until you re-programmed the arduino with new values. There would be ways to set it up to be programmed as far as the set temps and the switching, but that would take a lot more hardware such as an LCD screen and some switches for programming. It would also make the arduino code quite a bit more complex.